Celtic are among a whole host of clubs looking to secure the services of Tottenham Hotspur youngster Reo Griffiths this summer. According to The Sun, the Hoops are among teams looking to snap up the Spurs wonderkid this summer. The 18-year-old has put in some eye-catching displays for the Tottenham’s youth teams during the course of last season and stood out with his outstanding goal-scoring record at that level. It is no surprise that so many clubs are monitoring Griffiths as he has incredible potential to be a future-star in European football. The London-born starlet’s goal-scoring record at the Under-18 Premier League are second to none after he scored 34 goals while grabbing 11 assists in 34 matches in the last campaign. He also has three UEFA Youth League goals to his name in 9 European appearances. The England Under-17 international is exactly the kind of prospect who can flourish under the masterful guidance of Celtic manager Brendan Rodgers in the near future if given the opportunity to lace his boots for the Bhoys’ youth ranks. 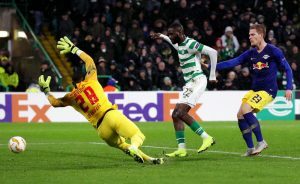 However, he will still need time to develop and grow as a player so the Celtic support needs to be patient with him to witness the best out of the player in the coming years. The Celtic academy is the ideal place to nurture his game as evidenced by the recent emergence of Kieran Tierney among many promising talents in recent years. Hence, a move to Parkhead might not be too far-fetched for the youngster. The Glaswegian heavyweights were very productive last season as they managed to claim another domestic treble and have also begun this campaign on the front foot after winning three matches in a row in Europe. Rodgers still needs to add a few promising young talents in this off-season so that the club can build for a bigger and brighter future at Parkhead. The addition of Griffiths will definitely improve Rodgers’ attacking options in the future. However, for now, the Spurs forward needs to keep his head down and concentrate on improving his game so that he can succeed at the highest level in a few years time. 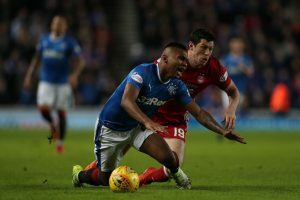 Read More: Celtic’s Third Bid Of £2m For 23 Y/O Scottish Midfielder Rejected: What Now For Rodgers? The potential acquisition of Griffiths will undoubtedly bolster the Celtic academy as they look to produce even more stars in the future. It remains to be seen what lies ahead in the future of Griffiths and whether he ends up making a switch to Glasgow this summer. Leicester City Manager Rodgers Set To Target Celtic Ace: Can The Hoops Keep Hold Of Him? 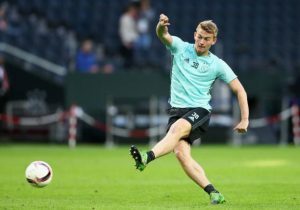 21 Y/O Celtic Winger Red Hot On West Ham United Radar: Where Can He Fit In? 26 Y/O Scottish Forward To Leave Celtic: Can The Hoops Afford To Lose Him?